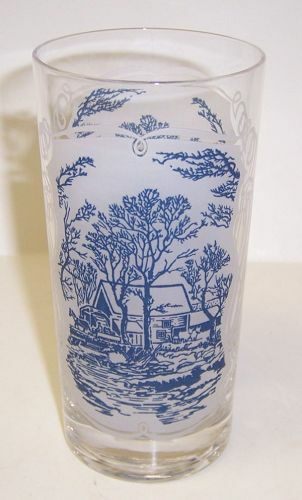 This is a really nice Currier and Ives 5 5/8 inch high 12 ounce clear water tumbler, or glass, with white background and the Covered Bridge design to accompany the Royal China set. 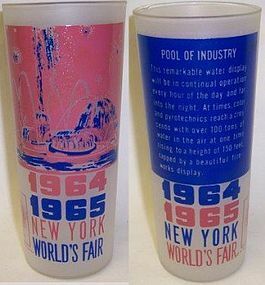 This tumbler is in very good condition with no chips, cracks or cloudiness. The design on the tumbler is all very good. 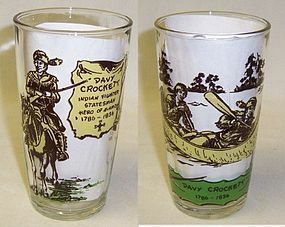 Be sure to search our other Currier and Ives pieces available. We guarantee items to be as described. THANK YOU. This really nice Childrens Bucking Bronco and Indian Mug was made by Hazel Atlas. This Mug is milk white with red design and lettering. It measures 3 iches high X 2 3/4 inches in diameter. It is signed HA and is in very good condition with no chips or cracks. The Cowboy and Indian design and lettering is all very good. Be sure to search our other childrens items available. We guarantee items to be as described. THANK YOU. 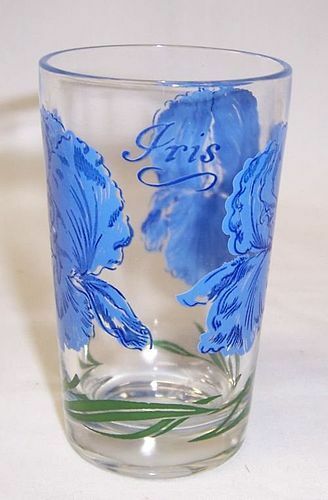 This is a really pretty 3 3/4 inch high X 2 1/4 inch diameter at the top Peanut Butter Juice Glass with the blue Iris decoration. The blue Iris lettering is at the top in script. This glass is in very good condition with no chips, cracks, scratches or cloudiness. We guarantee items to be as described. THANK YOU. This is a really pretty, 3 3/4 inch high X 2 1/4 inch diameter at the top, Peanut Butter Juice Glass with the blue Asters decoration. The blue Asters lettering is at the top in script. This glass can be hard to find. It is in very good condition with no chips, cracks, scratches or cloudiness. We guarantee items to be as described. THANK YOU. This pretty Ruby Red 1876 Cape Cod 11 3/4 inch diameter Footed Cake Plate or Cake Stand was distributed by Avon. This Cake Plate measures 3 1/2 inches high and is in mint condition with no chips, cracks or scratches. It is signed AVON on the bottom. We guarantee items to be as described. THANK YOU. This is a really pretty 5 inch high Peanut Butter Glass with the gray and pink Orchid decoration. The Orchid lettering is at the bottom in script. This glass is in very good condition with no chips, cracks, scratches or cloudiness. We guarantee items to be as described. THANK YOU. 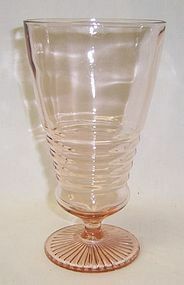 This is a really great vintage pink Soda Fountain Glass, could be used for Ice Tea, made in the 1950s. This Glass measures 6 3/4 inches high X 3 3/4 inches in diameter at the top. It is in very good condition with no cracks or cracks. We guarantee items to be as described. THANK YOU. 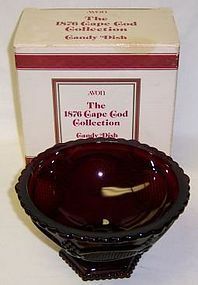 This pretty Ruby Red 1876 Cape Cod Footed Candy Dish, in the original box, was distributed by Avon. This Candy Dish measures 3 1/2 inches high X 6 inches in diameter across the top. It is signed Avon on the bottom and is in mint, unused, condition with no chips, cracks or scratches. The box is very good with just a couple light stains. Be sure to search our other Avon Cape Cod available. We guarantee all items to be as described. THANK YOU. 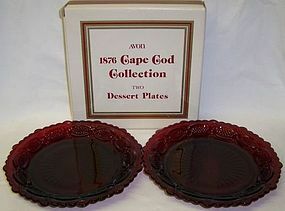 These two pretty Ruby 1876 Cape Cod 7 1/2 Inch Dessert Plates, in the original box, were distributed by Avon. Both Plates are in mint condition with no chips, cracks or scratches. They are signed AVON. Be sure to search our other Avon Cape Cod available. We guarantee all items to be as described. Feel free to email with any questions. THANK YOU. This pretty Ruby 1876 Cape Cod Bell with Clapper was distributed by Avon. This Bell is in mint condition with no chips, cracks or scratches. It is signed AVON inside the bell. Be sure to search our other Avon Cape Cod available. We guarantee all items to be as described. Feel free to email with any questions. THANK YOU. 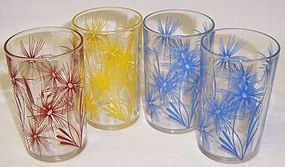 You are buying four 3 1/2 inch Swanky Swigs with Cornflower Number 2 decorations - 1 with red Cornflower, 1 with yellow Cornflower and 2 with light blue Cornflowers. All four tumblers are in excellent condition with no chips, cracks, scratches or cloudiness. The decorations are all very good. We guarantee all items to be as described. THANK YOU. 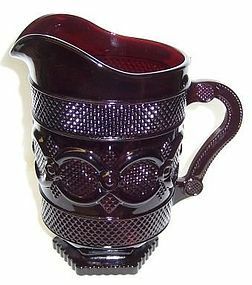 This pretty Ruby 1876 Cape Cod 8 1/2 Inch high Water Pitcher was distributed by Avon. This Pitcher measures 5 Inches in diameter and is in mint condition with no chips, cracks or scratches. It is signed AVON on the bottom. Be sure to search our other Avon Cape Cod available. We guarantee all items to be as described. Feel free to email with any questions. THANK YOU. This is a really nice crystal PRR Pennsylvania 4902 Railroad Roly Poly Tumbler with Train decoration. This Tumbler measures 2 1/2 Inches high X 2 1/2 Inches in diameter at the top. It is in excellent condition with no chips or cracks. The lettering and decoration is all very good. Be sure to search our other PA Railroad items available. We guarantee all items to be as described. Feel free to email with any questions. THANK YOU. This item consists of four 4 1/2 inch Tulip in Flower Pot Design Swanky Swigs Water Tumblers - 2 with red Tulips, 1 with blue Tulips and 1 with green Tulips. All four tumblers are in excellent condition with no chips, cracks, scratches or cloudiness. The decorations are all very good. 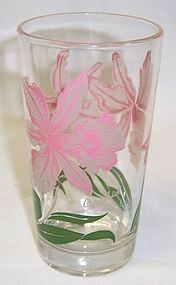 Be sure to search our other 40s 50s 60s glassware available. We guarantee all items to be as described. Feel free to email any questions. THANK YOU. 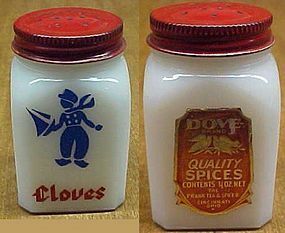 This really nice milk white 3 inch CLOVES Shaker is possibly a Tipp City shaker. This Shaker is in excellent condition with the original DOVE - 4 Ounce Quality Spice label still on the back of the shaker. The original lid is also in very good condition. We guarantee all items to be as described. Feel free to email with any questions. THANK YOU.